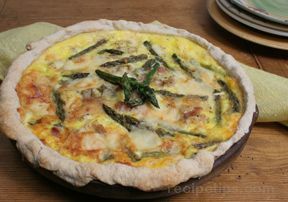 Asparagus come in many different varieties. The three color variations include green, white, and purple. 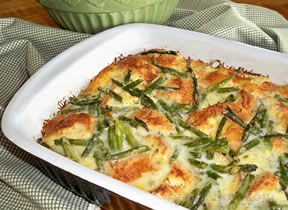 In the United States, the green variety of asparagus is the most common. 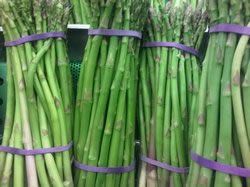 Hybrids of the green asparagus will only produce male asparagus which results in larger stalks, and larger quantities. 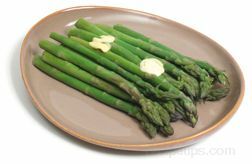 The difference being that female plants spend much of their energy on producing seeds, and therefore less energy on producing the edible asparagus spears. White asparagus are not a separate breed, but a difference in the growing process. White spears are obtained by mounding dirt or mulch on top of crowns to force the spears to grow underground, therefore preventing them from receiving any sunlight. This process causes the white spears to lack chlorophyll, which would normally cause the spears to turn green. Purple asparagus grows from a different breed than its green counterpart. The purple asparagus breed is known as "Purple Passion" and is increasing in popularity in the United States. Although similar in taste, the purple passion variety is also known for its slightly sweeter taste which is a result of its higher sugar content. 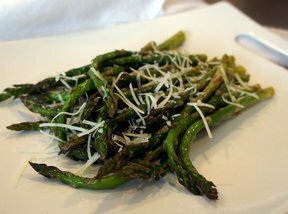 Green asparagus plants can be grown from seeds or roots known as crowns. Crowns are sold either prepackaged in a dormant state, or as plants. 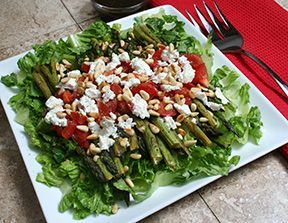 Growing asparagus from crowns is most common and generally recommended. When buying crowns, one important thing to consider is the time needed until maturity. Crowns are sold as one, two or three year olds. The older the crown, the sooner the plant will be ready for harvesting. One year old crowns and plants can generally be found in local nurseries or plant centers during the spring season. Two and three year old crowns can generally be ordered from a grower. Plants can usually be lightly harvested after they are three years old. The lifetime of a plant can range 15 or more years, so although getting started takes time and preparation, the payoff is long term. 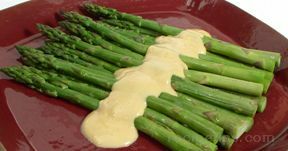 One of the first steps to successfully growing asparagus is identifying and preparing the area of your garden that will be dedicated as an asparagus bed. The garden location should have full sun or as close to full sun as possible with good drainage. 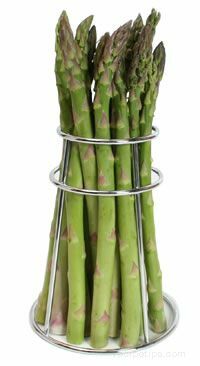 Asparagus are recommended for in the ground growing verses in flower pots because of their deep roots. Growing asparagus in the ground will help protect roots from the winter cold temperatures. To prepare the bed, quality compost material should be blended into the soil. Materials such as mulch or straw can be used to cover areas around plants to help keep down weed growth, which can be prevalent in asparagus beds. 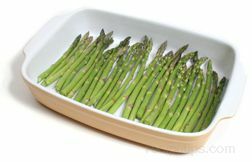 When it comes time for planting, asparagus can be planted in rows approximately 12 inches apart from each other. 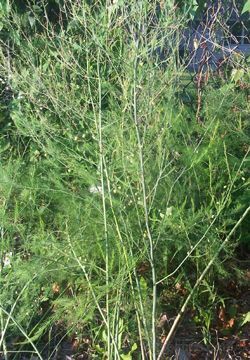 For best harvesting results, asparagus plants should not be combined in the same bed with any other plants. For organic growing options, old fashioned hand weeding will be necessary to keep weeds at bay. Use of mulch or straw between plants and rows can also be very helpful. Inspect plants regularly for pests, and cut away spears that appear effected. 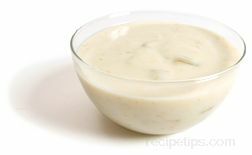 If an infestation progresses, consult a local nursery for organic treatments suggested for vegetables. Once plants become dormant in the winter, stalks can be cut off to help prevent rust. 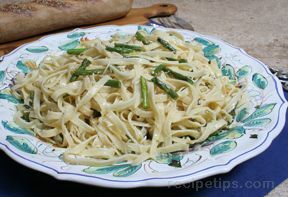 White asparagus is grown from the green asparagus plant. 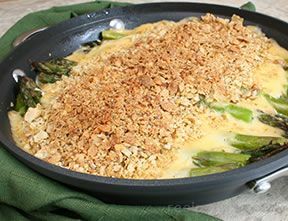 Following the same process for starting green asparagus in the garden, plants will need a minimum of 3 years before they can be successfully harvested for white asparagus. 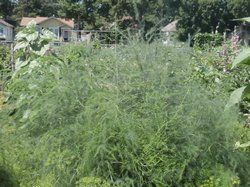 Older plants will produce a better crop, and it is not necessary to convert the entire bed to the white variety of asparagus. 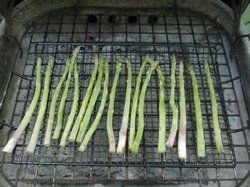 An acceptable growing procedure is to select one or two rows to convert to white asparagus, while allowing the remainder of the bed to grow into green asparagus. 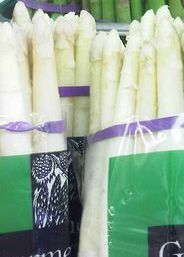 To achieve white asparagus, green asparagus plants must be kept away from sunlight during the growing process. 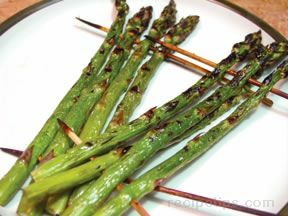 Once green asparagus tips are first seen popping through the soil in selected rows, mound soil or mulch loosely on top of plants six to eight inches deep. Plants will continue to push up asparagus spears attempting to break through the soil. Once spears are observed starting to crack through the soil or mulch mounds, the white spears will need to be harvested. 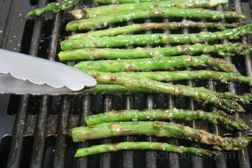 To harvest the spears, loosen the added soil or mulch from the tops of the selected asparagus plants using a sharp knife. Cut white spears close to the root crown. When harvesting has been completed, carefully recover root crowns with a normal amount of soil (omitting the additional six to eight inches). 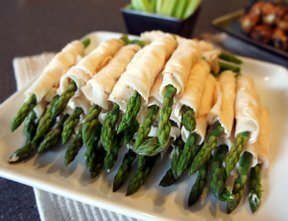 It should be noted that white asparagus, unlike green or purple, should generally be lightly peeled before preparing. 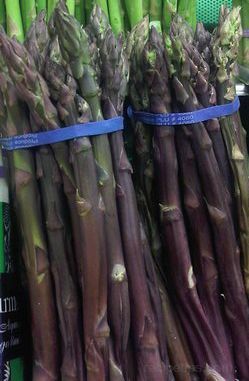 Purple asparagus is grown in the same manner as green asparagus. Purple asparagus crowns are less common and can be harder to find then their green counterparts. 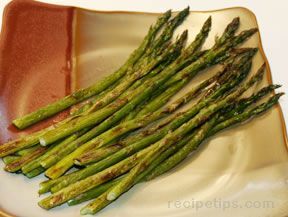 Usually, purple asparagus crowns can be ordered directly from a grower or nursery. Purple asparagus is generally green and purple while growing and turns completely purple when ready for harvest. 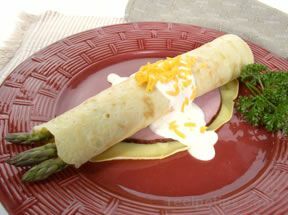 Purple asparagus can be grown in rows alongside of green or white asparagus without conflict. 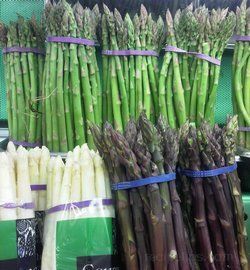 Although purple asparagus tend to grow in thicker stalks, they are noted as being less stringy and therefore more tender than their green counterparts. 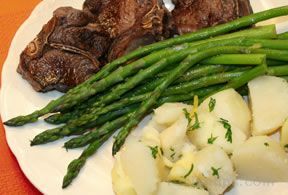 As with green or white asparagus, spears should be cut off near the crown with a sharp knife. Crowns should be carefully recovered so that roots are not left exposed. 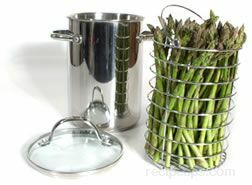 Growing Asparagus Plants can be a great and easy way to harvest home grown, organic, fresh asparagus. 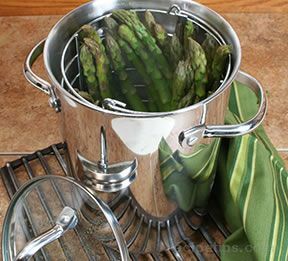 Knowing how to properly grow asparagus is the key to a successful start to many years of harvesting.